These cute and fun animal soaps will make every child want to wash their hands - before and after meals, snacks, etc. To microwave-safe measuring cup, add 5 oz. of cut up white soap. Heat in microwave until completely melted. In plastic beaker, mix 3.5 ml Kiwi Strawberry fragrance with 1.75 ml Vanilla Color Stabilizer. Set aside for at least 2 minutes. To melted soap, add 2 drops of the Stained Glass Strawberry Red Liquid Color, fragrance mixture and stir well. More color can be added if darker shade is desired. Pour soap into two cavities. Spritz tops of soap with rubbing alcohol. Repeat steps 1-4 with next color, filling two more cavities. Continue with last two colors until all mold cavities are filled. Let soaps completely set up. Remove soaps from molds. If hard to unmold, place in freezer for 20 minutes, turn molds over and gently push to release soap. For remaining four soaps, you can choose what colors you want to use. 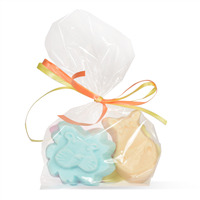 Package 3 soaps in poly bag and tie with coordinating ribbon. Ingredient Label: Sorbitol, Propylene Glycol, Sodium Laureth Sulfate, Stearic Acid, Myristic Acid, Water, Sodium Hydroxide, Sodium Cocoyl Isethionate, Titanium Dioxide, Orange 4, Yellow 5, Blue 1, Red 33. "Should the soaps be shrink wrapped to prevent sweating???" Staff Answer MP soaps should always be wrapped after they are made. 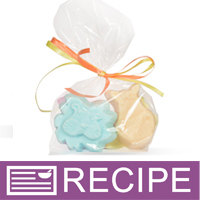 The soaps in this recipe can be placed into the Poly bags and tied tightly shut with ribbon. If you live in a humid climate or are concerned with excessive sweating you could wrap the soaps in plastic wrap or shrink wrap before placing in the Poly bags.